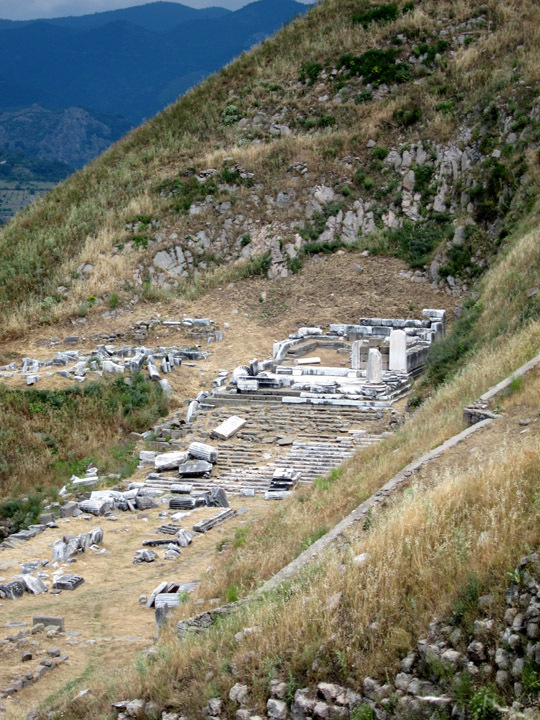 Greek settlement in Pergamon dates to the 8th century BCE. 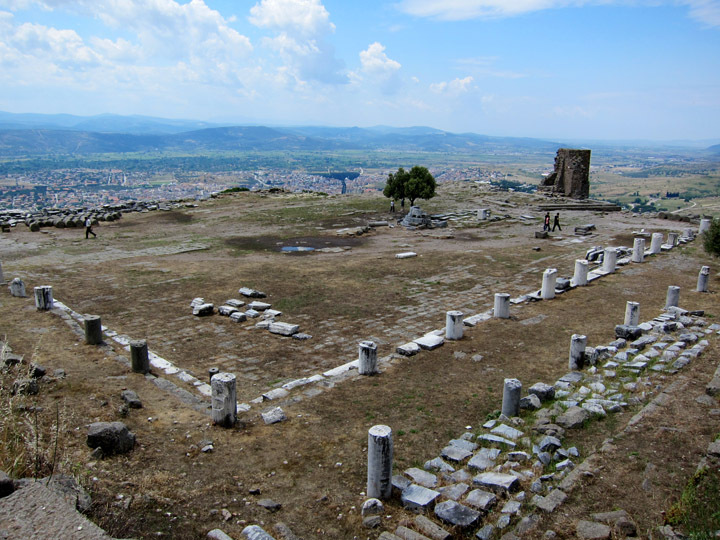 After bouncing between the Persians and Thracians, Pergamon became a kingdom of its own with the founding of the Attalid Dynasty by one of Alexander the Great’s generals. 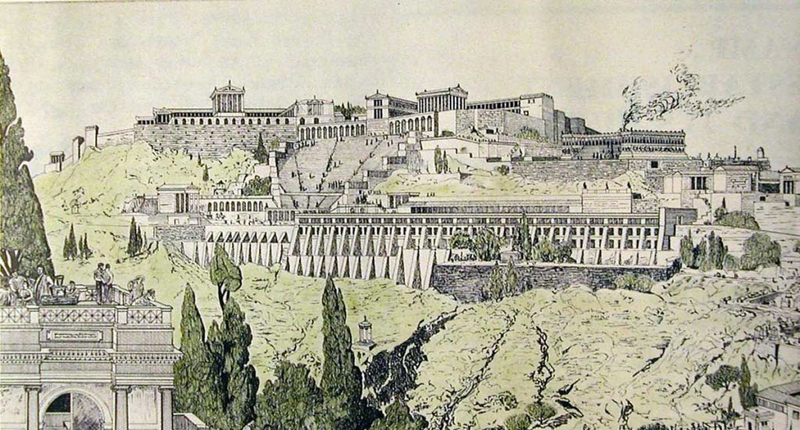 The city flourished as a center of learning and Hellenic art before joining the Roman Empire in 133 BCE. Its hard to separate Pergamon from its unique surroundings. 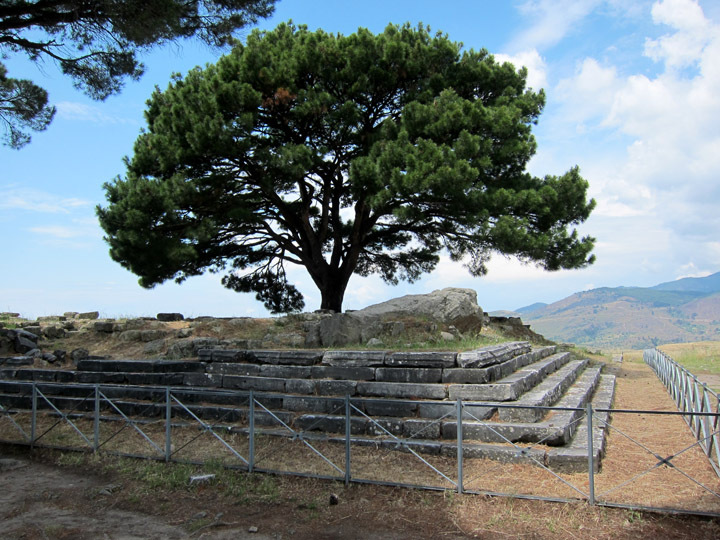 Perched upon an isolated peak, Pergamon dramatically integrates into its environment. A steep 10,000 person theater clings to the mountain side offering what must have been distractingly good views when a performance became boring. 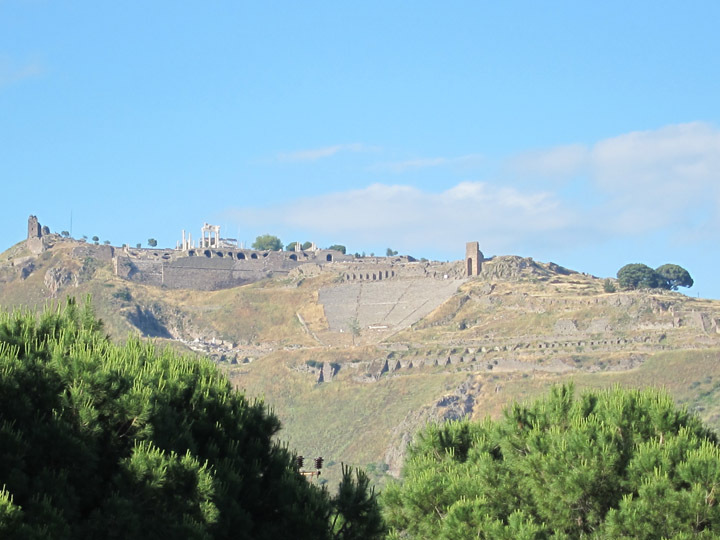 The cliff-side theater with a view of modern Bergama below. The most complete building complex is the Roman Trajan complex or “Trajaneum” named after the cult temple to the Emperor. 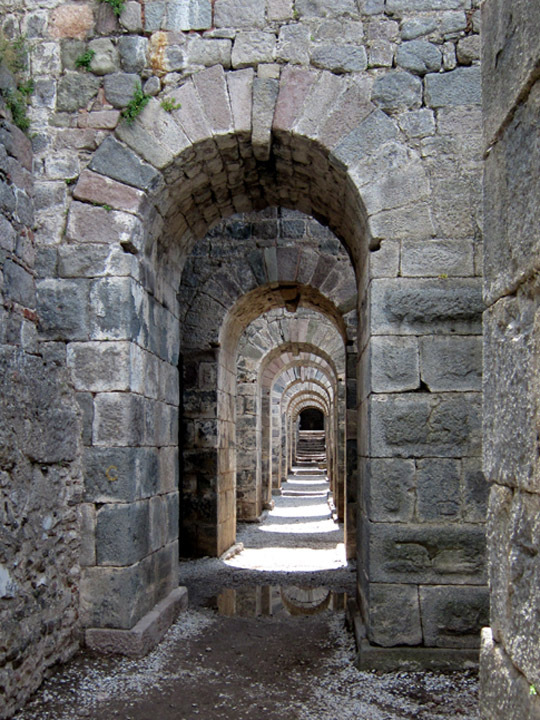 A series of cavernous arched storage chambers provide the foundation for the upper story temple, offices, and other business rooms. 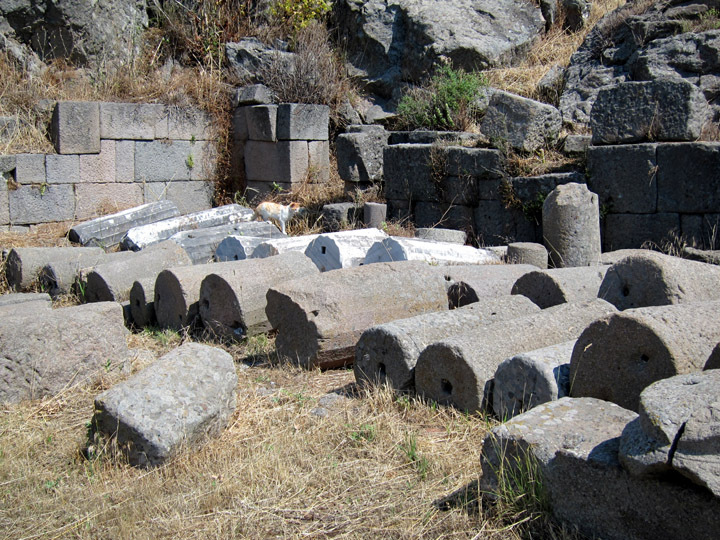 Remains of the upper city of Pergamon. The Trajaneum is visible behind the theater. The stone of the Trajaneum ground floor is noticeably more durable and the walls much more thick than the marble and limestone of the upper story. 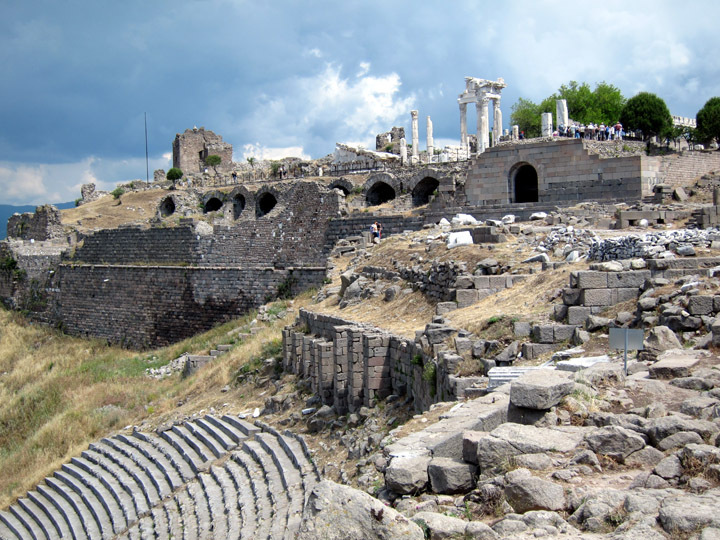 Ancient Pergamon was known for its massive library which is said to be second in size only to the ancient library in Alexandria. Marc Anthony supposedly gave this 200,000 volume library to Cleopatra as a gift. Today only the foundation of the central colonnaded courtyard is visible. 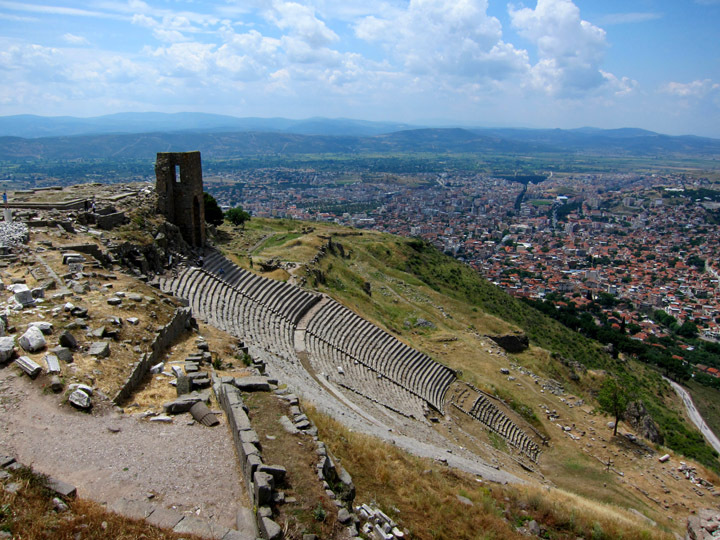 The dominant ancient structure would certainly have been the Great Altar of Pergamon believed to be dedicated to Zeus. A temple would have stood at the tops of a massive stair case. Only the 36 meter by 33 meters foot print remains in Turkey today. As part of the 19th century European excavation, sculptural and architectural pieces were removed and are still on display at the Pergamonmuseum in Berlin today. The Great Altar was decorated with a frieze depicting the epic battle between the Greek gods and the Giants. These statues are done in a high Hellenistic style filled with emotion, movement, and very dramatic compositions. For example, look at how the figures in the Athena frieze section gracefully twist around each other and yet still appear to be in conflict. While many of the dominant structures have collapsed and the major works of classic Greek sculpture have been removed, there are still delightful remnants of the city through the Pergamon site. For example, the small Temple of Dionysius is not far from the theater which must have been convenient for nights of revelry. 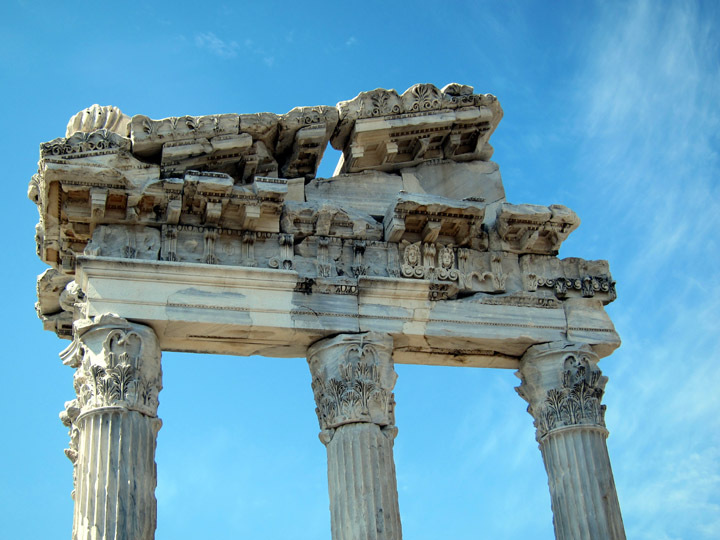 Several columns, capitals, and a partial pediment among the Roman palace complex hint at the elaborateness of these buildings. 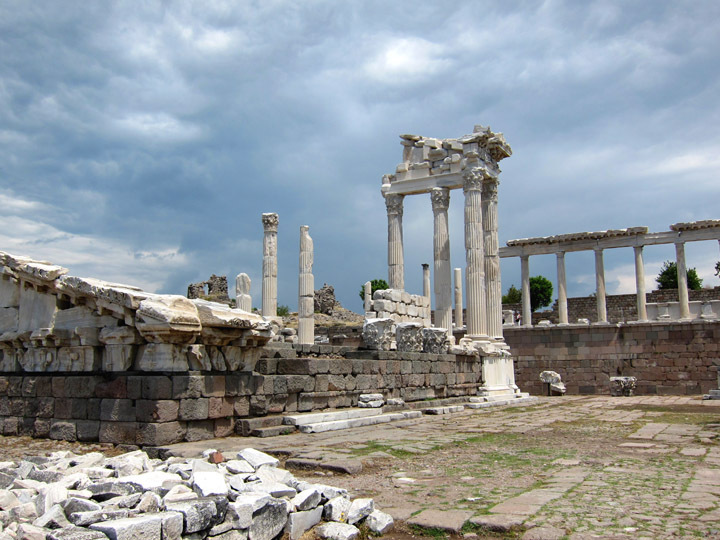 Two days ago, the UNESCO World Heritage Committee voted to add Pergamon (or Bergama) to the World Heritage List. 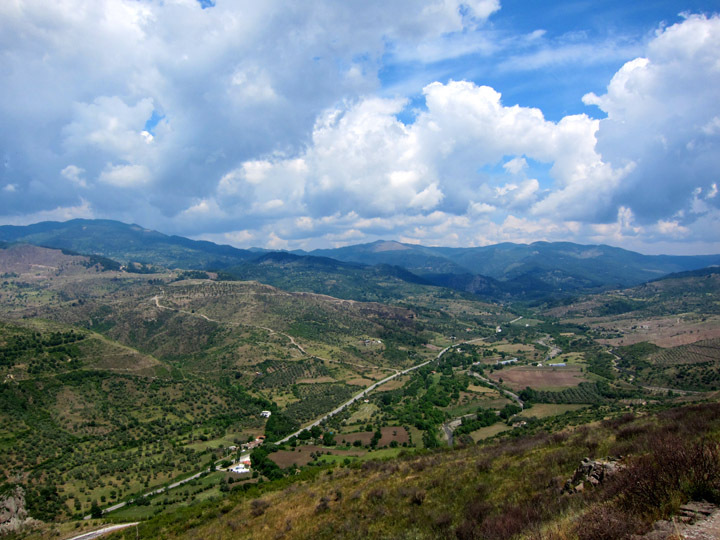 This archaeology site was recognized as one of the “most spectacular multi-layered sites” with its highly valuable monuments and artistic remains. This distinction comes even though many of the artistic pieces from this site were removed a century ago and are on display in Berlin. The UNESCO honor denotes the extensiveness, natural beauty, and historical significance of this hill top ancient capitol. I would say that this designation is very appropriate. One of the magnificent views from Pergamon. 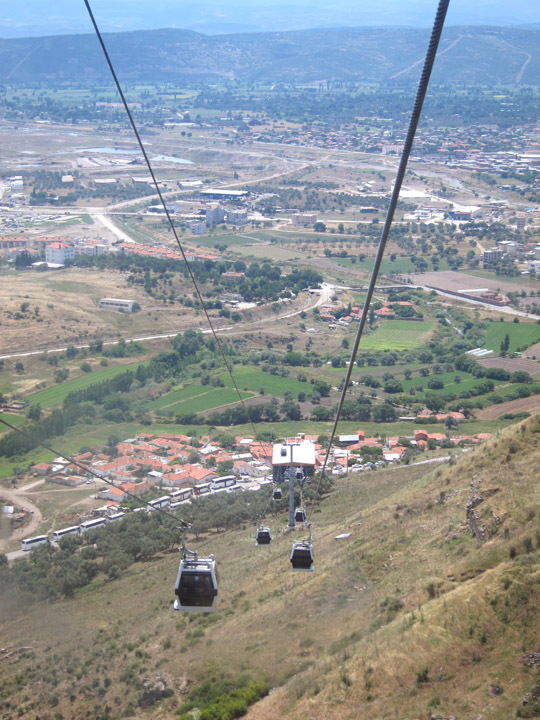 If you are interest in visiting Pergamon today, there is a very scenic cable car to the top from modern Bergama. Like UNESCO World Heritage sites and archaeology? Then check out some of my other ancient adventures!